Ink-a-Doodle Creations: Wedding Gift Bag! Good morning crafters! Thanks for joining me here today while I'm creating over Stylin' Stampin' INKspiration. Today we are sharing fun creative projects using any of the three punch boards from Stampin' Up! My niece got married just this past weekend so I needed a small gift bag to put her gift inside. Yes, small, cause she got $$ to put towards getting them a washer/dryer set for their new home. 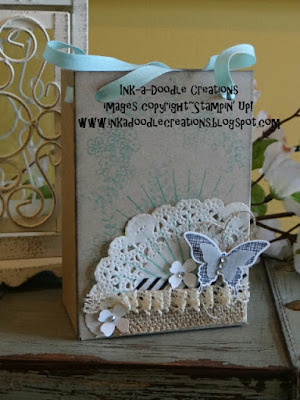 I created this gift bag using the all new Gift Bag Punch Board from Stampin'. It can create three different sizes but in any height from 4-12 in. I also tried to decorate the outside the go along with her card using the Kinda Eclectic stamp set. You can click here to go see it! I hope you have enjoyed my gift bag. Leave some "love" and go see which punch board the other designers used and what they created with it.